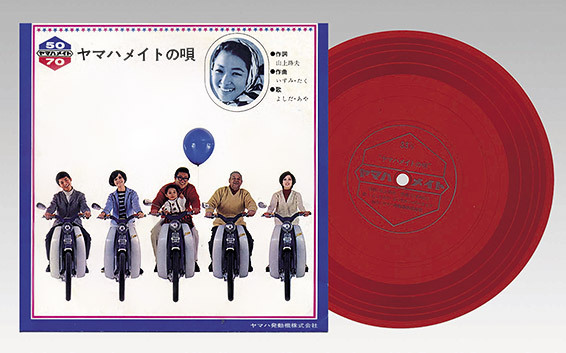 “I’m riding, I’m riding, I’m riding, I’m riding…a Yamaha Mate!”—In the mid-1960s, Yamaha debuted a new moped, the Mate, along with a TV commercial for it featuring a catchy jingle. The commercial made Yamaha a household name throughout the country. Small, moped-style motorcycles were known as a practical means of transport, good for delivering packages and running other errands, and the market for them had exhibited stable growth. The new Yamaha Mate series was developed through the concerted efforts of the engineering team. 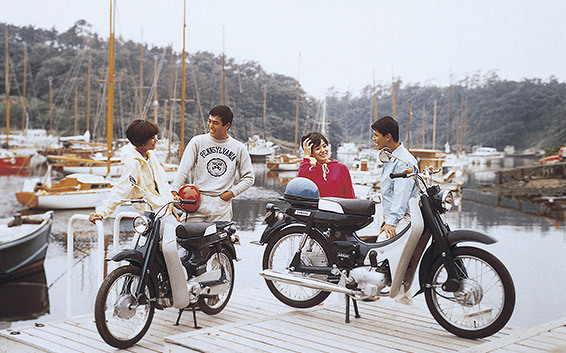 Two models debuted on the market in July 1965, the 50 cc Yamaha U5 Mate and U5D Mate. Another version, the 73 cc U7 Mate, was launched in December that same year. Yamaha’s Marketing Department tried a completely new approach to promoting the Mate before its launch. 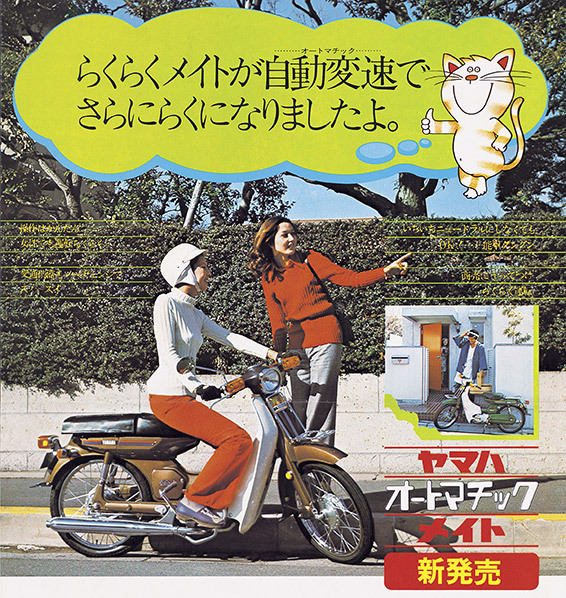 The department conducted a campaign to name the moped in order to fully promote its appeal, soliciting ideas from both inside and outside the company. The campaign generated a flood of responses as some 215,000 suggestions poured in. “Forte,” “Mate,” “Doll,” and “Pal” were selected as finalists, and after a rigorous judging process, the now familiar “Mate” was chosen. A famous songwriter was asked to write the jingle for the Mate’s initial commercial. The limited advertising budget meant only the first verse of the song could be completed, so the staff took it upon themselves to do the second and third, with some assistance from the advertising company. The synergies of coupling the resulting song with the TV commercial shot in 1967 showing a chimpanzee riding a Mate resulted in the song being widely sung by children and adults alike. 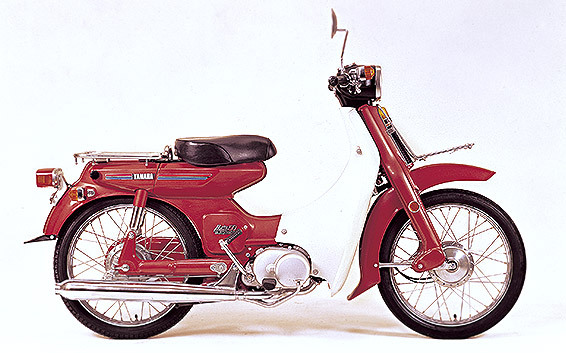 In addition, the 50 cc V50 and the 72 cc V70 were put on the market in February 1971 under the name “Rakuraku Mate.” This was followed by the development of an automatic 2-speed transmission, which spurred the launch in February 1973 of the 50 cc Automatic Mate V50A and the 72 cc V70A. Although it took some time for the convenience of the automatic transmission with its easy operation to catch on in the market, the establishment of a new market category defined by an automatic clutch for the first time reverberated greatly throughout the industry. The mopeds featured easy handling thanks to the lack of a gear change pedal and were roundly supported by female riders. The 2-speed, automatic transmission-equipped engine was also incorporated into the transmission specifications of a new compact model, the Chappy, that debuted in June 1973. This served to help cultivate new demand for the 50 cc class.